with additional support from Nothern Digital Inc.
Prof. Leo Joskowicz, PhD, The Hebrew University, Jerusalem. Prof. Moshe Shoham, DSc, Technion-Israel Institute of Technology. The goal of the Symposium is to convene in Israel clinicians, scientists, and engineers actively interested in medical imaging, computer science, and robotics, and their application to the planning, monitoring, and execution of medical surgeries. The symposium is the sequel of ISRACAS'98 , ISRACAS'99 , and ISRACAS'2000 . Each was attended by over 150 participants (evenly distributed between clinicians, industry, and engineering academia). The one-day events included four to six invited speakers, 10-15 oral presentations of refereed papers, an industrial exhibit, and system demonstrations. Abstracts of the selected peer-reviewed papers are published in the Journal of Computer-Aided Surgery. The one-day symposium consists of five invited talks by internatiolly recognized experts, 14 paper presentations, a special prespectives from industry session, and project and product exhibits. Full-length technical papers or extended abstracts (3-5 pages) of surveys, clinical studies, position papers, and panel topics for presentation at the Symposium are solicited. Submissions will be reviewed by members of the local and international program committee. Accepted extended abstracts will be published in a preprints booklet to be distributed to Symposium participants. Authors should send either electronic copies (preferred) in Word, LaTeX, Postscript. or plain text, or hard-copies (3 sets) to Prof. Joskowicz. One session of the symposium will be devoted to industry. The goal is to showcase research and development activities and clinical and technical achievements of active leading companies in the field. Up to six selected companies will have the opportunity to make a short technical presentation that can be accompanied by an exhibit which will be located in the entrance hall of the conference room. An equipment and systems exhibition will be be held in parallel to the lectures. Exhibitors will get a chance to address the audience. If you want to exhibit your system, please contact the organizers. Robotic Surgery; Automated or Hands-on? Technion and The Hebrew Univ. of Jerusalem, ISRAEL. Inst. of Mathematics and Computer Science in Medicine, Univ. of Hamburg, Germany. L. Joskowicz and M. Shoham, The Hebrew U. and Technion ISRAEL. "Enhanced CAS: integration of pre- and intraoperative multimodality data sets in the surgery of the skull base"
Dept. of Neurosurgery, University of Leipzig, GERMANY. "Clinical experience with routine application of interactive image-guided neurosurgery system in the treatment of frameless surgical navigation system in 112 neurosurgical patients"
"Navigated insertion of dental implants"
J. Brief, S. Hassfeld et al. Dept. of Oral and Maxillofacial Surgery, U. of Heidelberg, GERMANY. "Projector-based intraoperative visualization of surgical planning data"
Inst. for Process Control and Robotics, U. of Karlsruhe, GERMANY. "Computer-assisted surgical navigation using fluoroscopy: first clinical use in spine surgery"
P. Merloz, C. Huberson, et al. Univ. Department of Orthopaedic Surgery, Grenoble, FRANCE. "The virtual cylinder concept and its application in radiation-free updates of in-situ surgical fluoroscopy "
G. Zheng, J. Kowal, et al. M.E. Muller Inst. for Biomechanics, U. of Bern, SWITZERLAND. "Long Bone Panoramas from flurosocopic X-ray images"
School of Computer Science and Eng., The Hebrew University of Jerusalem, ISRAEL. "Intraoperative Gamma camera using semiconductor Gamma detection"
"Totally non-invasive tumor ablation using high intensity focused ultrasound"
InSightec - Image Guided Treatment Ltd., ISRAEL. "Control considerations of tele-operated endoscopic tools"
Dept. of Mechanical Engineering, Technion, and Ben-Gurion University, ISRAEL. "A variational approach for gray matter segmentation using coupled surfaces"
Dept of Computer Science, Technion, ISRAEL. Dept. of Biomedical Engineering, Tel-Aviv University, ISRAEL. "Variational classification for visualization of 3D ultrasound data"
School of Computer Science and Engineering, The Hebrew University of Jerusalem, ISRAEL. "Automatic analysis of ovarian tumors based on ultrasound imaging"
Medical Physics Department, Tel-Aviv University, ISRAEL. "CT integrated robotic system for interventional procedures"
J. Yanof, P. Klahr et al. Presentations by leading companies in Israel including Omikron Delta, Silicon Graphics Israel, DenX. The Symposium will be held at Gan Oranim, Ganei Hataarucha, in Tel-Aviv, near Tel-Aviv University. 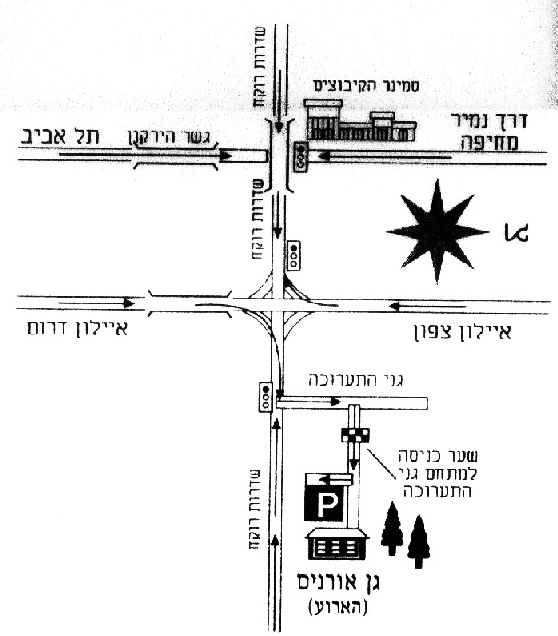 Click here to access Gan Oranim's web site, or here to see a map of how to get there. ARIEL TRAVEL & TOURS (1981) LTD. Participants are required to register and pay a nominal fee which entitles them to a full lunch, acopy of the Symposium proceedings, and coffee break refreshments. We encourage participants to register early, as the number of participants will be limited. Members of the ISMBE are entitled to 50\% discount. Payment is by check made to "TECHNION" or on-site by cash. Please note that we cannot accept credit card payments. Last updated: April 8th, 2001 by Leo Joskowicz.